Aerosol particles are ubiquitous in the Earth’s atmosphere and are central to many environmental issues such as climate change, stratospheric ozone depletion and air quality. In urban environments, aerosol particles can affect human health through their inhalation. Atmospheric aerosols originate from naturally occurring processes, such as volcanic emissions, sea spray and mineral dust emissions, or from anthropogenic activity such as industry and combustion processes. Aerosols present pathways for reactions, transport, and deposition that would not occur in the gas phase alone. Understanding the ways in which aerosols behave, evolve, and exert these effects requires knowledge of their formation and removal mechanism, transport processes, as well as their physical and chemical characteristics. Motivated by climate change and adverse health effects of traffic-related air pollution, aerosol research has intensified over the past couple of decades, and recent scientific advances offer an improved understanding of the mechanisms and factors controlling the chemistry of atmospheric aerosols. 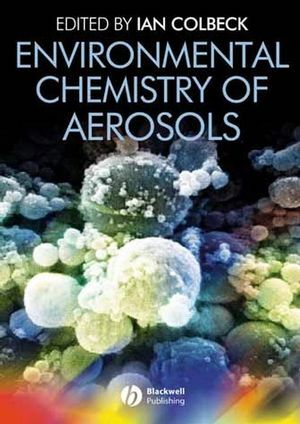 Environmental Chemistry of Aerosols brings together the current state of knowledge of aerosol chemistry, with chapters written by international leaders in the field. It will serve as an authoritative and practical reference for scientists studying the Earth’s atmosphere and as an educational and training resource for both postgraduate students and professional atmospheric scientists. Professor Ian Colbeck leads the Aerosol Science Group in the Department of Biological Sciences, and is Director of the Centre for Environment and Society at the University of Essex. 1. Physical and Chemical Properties of Atmospheric Aerosols. 3. Mass Transfer to Aerosols. 6. Thermodynamics of aqueous systems. 7. Stratospheric Chemistry: aerosols and the ozone layer. 8. Aerosol Chemistry in Remote Locations.